Hi guys, A great weekend has just passed with all anglers reporting good numbers of good condition fish from all Taupo rivers. The stand alone river being the mighty Tongariro which has produced great fishing all last week and seems to be the most consistent when it comes to spawning fish continuously trickling through. It is so nice to hear anglers reporting happy fishing experiences instead of negative stories, lets just remember that all fisheries have problems from time to time but they come right eventually. The boaties are still getting good fish in the lake but I will expect that to come to a stop when they decide to stack up at the river mouths and run the river. The fish that have been getting caught with trolling methods in deep water have been silver, fat and orange fleshed so this is a great sign of whats to come for the fly fisherman when that magical time of year hits. The river is still fairly quiet with anglers and it is not un common at the moment to go hours without even seeing another angler as long as you are getting away from the town pools. It’sÂ a nice feeling to jump into some prime water at ten o’clock and still be the first through it and get the best fishing. Most of you will also notice next time you are up that alot of the slime that developed on the river bed seems to have washed away in the last decent rain which is great as it will make wading a little easier for some of you. Wading may be easier but the force of water is starting to slowly increase so be careful where you decide to attempt crossings as the river will become more and more un predictable going into the winter. Most anglers I think are using the nymphing method but as usual the old traditionalists have been swinging that wet with good amounts of success using Wooley Buggers and Red Setters. Over the past week I have always made my first choice of fly a glo bug and that seems to have been capable of working most of the day. If you find yourself struggling don’t forget that they are very use to seeing natural patterns so don’t be scared to whack a hare and copper or PT nymph on -these patterns will always be taken in most rivers over New Zealand. As usual all inmates at TRM have experienced great fishing over the past week due to the guidance and direction of motel manager Pip and sidekick Boof, so staying at this awesome little motel almost certainly guarantees some sort of action during your stay. The atmosphere at TRM is always friendly and if you do struggle with the fish you can always find someone that will point you in the right direction. The next few months are the guiding quiet time and a you all well know I consider this my only job so it might be aÂ good time to hit me up for a deal ofÂ a lifetime-drop me an email and lets see if we can get you on the water and amongst fish asap. 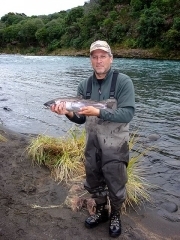 With more rain and cold starts forecast the fishing can only stay the same or get better so don’t punish yourself in front of that computer in the office come up and spend a day with me on the mighty Tongariro-you wont regret it! !.